Kishor Gulabivala is Head of Endodontology and Department of Restorative Dentistry at the Eastman Dental Institute, University College London. He is also an Honorary Consultant in Restorative Dentistry at the Eastman Dental Hospital, University College London and Hospital Trusts. Kishor graduated from Birmingham Dental School in 1980. After 3 years in general practice, he completed the MSc in Conservative Dentistry in 1984 and consolidated training in Conservative Dentistry as a registrar from 1984 to 1986. He was appointed Lecturer in Conservative Dentistry in 1987, when he also enrolled onto higher training in Restorative Dentistry at the Eastman Dental Hospital (1987-1994) at the end of which he was appointed Consultant in Restorative Dentistry. He established and ran the MSc in Endodontics (1989), the MClinDent and specialist training programmes in Endodontics (1999) and the Diploma in Endodontic Practice (2011). He also established and ran the clinical endodontic service at the Eastman Dental Hospital from 1994 to 2004. Kishor was entered on the UK Specialist Lists in Restorative Dentistry, Prosthodontics and Endodontics when they were established in 1999/2000 and completed his PhD on microbial infections of teeth in 2004. He was Training Programme Director for Restorative Dentistry at the London Deanery between 2006 and 2011; and is now the Training Programme Director for Endodontics in London (2012-2015). 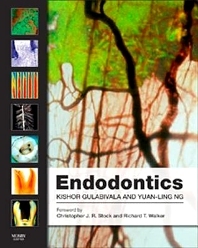 Kishor’s research interest is centred in Endodontology and has published widely both on basic and clinical research questions with over 100 peer-reviewed papers and over 100 research abstracts. He also serves as Associate Editor of the International Endodontic Journal. Dr. Ng graduated from the University of Hong Kong in 1985 and spent 9 years practicing general dentistry in the Government Dental Service in Hong Kong. She was granted the Hong Kong Government Scholarship to undertake the Master of Science programme in Endodontics at the Eastman Dental Institute in 1994-5 which she passed with distinction. Upon completion of the programme and return to Hong Kong, she was promoted to Senior Dental Officer. During the two years of this office, she developed a referral endodontic service for the Government Dental Services. She was also appointed Honorary Clinical Lecturer at the University of Hong Kong and contributed to their postgraduate programmes. In 1997, she returned to the Eastman Dental Institute as a full-time Clinical Lecturer in Endodontology. She was promoted to Senior Clinical Lecturer in Endodontology in 2010. Dr. Ng served as a Senior Programme Coordinator for 10 years and became the Programme Director for the MSc in Endodontics and MClinDent in Endodontology programmes in 2007. She is currently also the Educational Supervisor for the Specialist trainees in Endodontology. Dr Ng has lectured widely to local and international professional groups. Dr. Ng is a UK General Dental Council registered specialist in Endodontics and a certified member of the European Society of Endodontology. Dr. Ng’s other professional commitments include her membership of the scientific committee of the British Endodontic Society and the European Society of Endodontology; and Associate editorship of the International Endodontic Journal. Dr Ng’s research interests are focused on the effectiveness and long-term outcomes of endodontic treatment. For her completed PhD program she researched the clinical outcome of endodontic treatment. She has published widely in international peer-reviewed journals with over 40 peer-reviewed articles and 80 research abstracts.